Range: Northern Canada through to Panama, including much of the Caribbean. Habitat: The Red-tail is a bird of open country, such as grasslands and desert. They will also use farmland, and often perch on fence posts and telephone poles. Diet: Mostly mammals, ranging in size from voles to jackrabbits. Birds up to pheasants in size are taken. Also snakes, amphibians, insects, and carrion. Lifespan: Up to 21 years in the wild. 18-25 years in captivity. The oldest Red-tailed Hawk on record lived to be almost 29 years old. Aerea was hit by a car, and is now blind in her left eye. This affects her depth perception, so she cannot survive on her own in the wild. 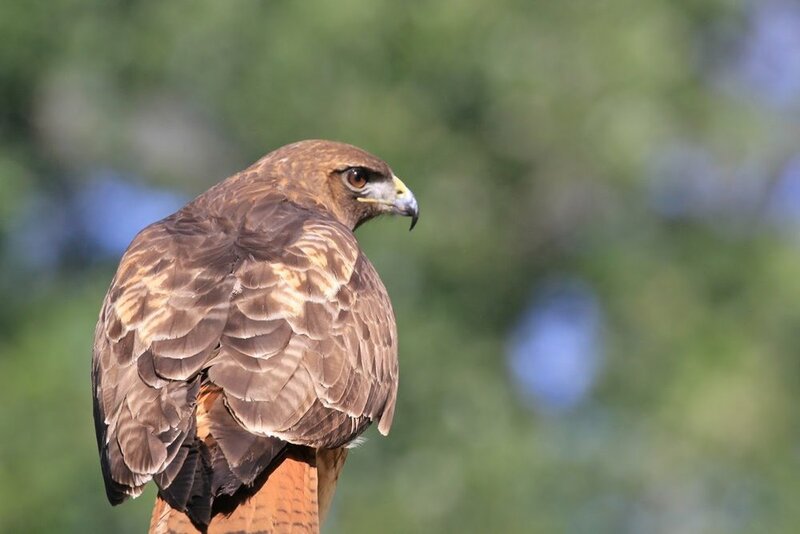 Red-tailed Hawks are the second largest Buteo hawk in North America. Only the Ferruginous Hawk is bigger. Pairs of Red-tailed Hawks mate for life. There may be as many as 14 different subspecies of Red-tailed Hawks, which are often variable in plumage, though most have the distinctive red tail and dark belly band. The dark subspecies “Harlan’s Hawk” of Alaska lacks both the red tail and belly band. Because of this it was formerly considered as separate species. The scream of the Red-tailed Hawk is often used for the call of the Bald Eagle in movies. Red-tailed Hawks can catch rattlesnakes; however they are not immune to the venom. Red-tails are one of the most common and widespread hawks in North America.